My day job is being a freelance software developer with dawnlabs. I was also one of the people who helped start up the Transcend Madison Innovation Competition, which came out of Transcend Engineering. Transcend Engineering is a UW student organization that was founded in 2013 and created to provide a campus project hub. It’s a resource for people from any major who are interested in making things and is helping promote a culture of entrepreneurship on campus. Transcend Madison grew out of this. It’s the UW’s first-ever student-led innovation competition and I was one of the people who helped launch it in 2016. There had been a number of innovation competitions at UW-Madison in the engineering and business schools (the Schoofs Prize and Burrill Competition, respectively) that were no longer offered. I thought this was a shame and helped spearhead the Transcend competition. Last year 27 teams participated and for 2017 there will be 33 teams competing for $40,000 in prizes. We’re thrilled to have the support of a number of local businesses, especially QualComm, whose commitment will help ensure the long-term sustainability of the Transcend Competition—always a challenge with student-run organizations. 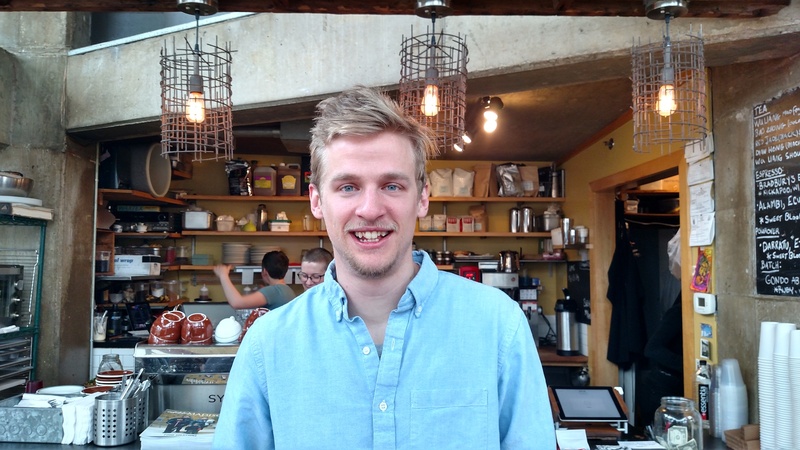 My most memorable caffeine was the coffee I recently had at a little shop in Seattle: The Slate Coffee Bar. This was in the northern part of the city and reminded me of San Francisco, because it’s so hilly. I had a great coffee—it was sweet, fruity and delicious—and struck up a conversation with the barista. Somehow we got to talking about personality tests, especially the Myers & Briggs. I’ve never put a lot of stock in those, but I’d recently done it because one of my friends is really into them. The barista was able to fill in my “type” (which is ENFP—or Extroversion + Intuition + Feeling + Perceiving) based on the fact that I ordered a straight forward drip coffee, which is my go-to drink—so maybe there’s more to them than I thought! Apparently it’s common for people who score in the “FP” range not to venture out of their comfort zone, at least when it comes to food, and that’s true for me. My current caffeine of choice is usually a drip coffee or a pour over when I can afford it. I’m a barista at 5th Element Coffee, so I’ve become quite good at understanding the mix of water quality and temperature, coffee grind and the weight of the coffee and water needed to make a good pour over. But that doesn’t mean I always do it at home! Sometimes it’s just about having a hot coffee or sharing one with friends, more than having a perfect cup. My favorite place for caffeine. I actually have three: Bradbury’s Coffee—they got me in the door with their free espressos—Fifth Element and Crescendo. Crescendo is close to my home and their coffee is really good every time. I think they’re quite underrated. The person I’d love to share a cup of caffeine with is Kurt Vonnegut. I first read a lot of his stories and books in high school—at a time when I was trying to figure out my ideology and belief—and I found that his writings really spoke to me. Two of my favorite books of his are God Bless You, Mr. Rosewater and Galápagos. These aren’t necessarily the books that most people pick as their favorites, but they resonated with me—there’s a lot of zany humor and I’ve actually laughed aloud when reading them. I also like Welcome to the Monkey House, which is a short story collection. World problem that could be solved with the right amount of caffeine: I’d love to see us take a micro approach to solving macro problems. There are so many huge problems—racism, sexism, violence—and a tendency to think there’s a silver bullet that will solve them at a macro level. But I think the solution really lies in changing many people in small ways. Here’s an example to illustrate what I mean. Take the income gap in San Francisco. With the explosion of technology there are people earning huge salaries and moving into and gentrifying areas where people are trying to get by on the minimum wage. Some of the big companies in the area—like Google—are giving millions of dollars to try to address the disparities created by the income gap. But what if instead of Google giving a million dollars, a thousand Google employees each gave $1,000 to a local cause? You’d have the same overall dollar value, but you’d get a lot more people involved and each of these people could make their donation to an organization in their little corner. These are organizations that could really do something with $1,000 and probably won’t see any portion of the million dollars. The impact could be amazing.